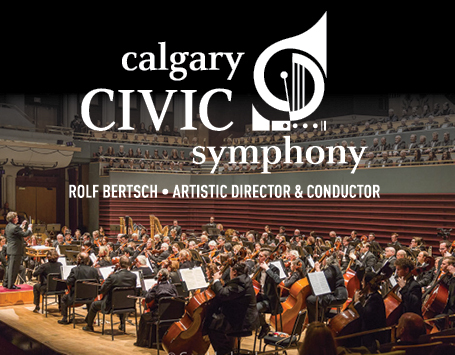 The Calgary Civic Symphony is Calgary's only community orchestra composed of professional and non-professional musicians dedicated to performing the works of great classical orchestral composers in Calgary's premiere performance venue, the Jack Singer Concert Hall. The Orchestra Society of Calgary/Calgary Civic Symphony exists for three reasons. First, we provide an opportunity for a group of dedicated professional and non-professional musicians who spend their spare time practicing and rehearsing to maintain their orchestral skills at a high level and to keep classical music alive through beautiful orchestral performances. Second, our performances are accessible broadly to Calgary society including children because of our price structure. Third, we give back to the Calgary community through our support of young musicians, our participation in public programs, and our donations of tickets in support of other non-profits and charities. Over the course of our performing year we directly touch the lives of approximately 6,000 people in a variety of ways through our five concerts, our involvement in Alberta Culture Days and our operation of the Rotary Calgary Concerto Competition. Our concerts draw an average of 1,000 people ranging from young children to senior citizens. The audience also includes those in our community that we have reached out to through the Sun Life Arts and Culture program and others to whom we have provided complimentary tickets for a variety of causes. In 2017 – 2018, as part of our Canada 150 season, we also reached out to Alberta’s indigenous community and our initial pre-concert performance brought group of performers including singers, drummers and dancers to the Jack Singer for a program that involved significant audience involvement – and involvement that was lauded by the audience members. Each of our concerts spoke directly to our relations with our western hemisphere neighbours as we offered programs featuring music by Canadian, Latin and American composers. Our December program featured Quebec author Roch Carrier narrating his “The Hockey Sweater” with the orchestra. Each year, the Civic has also featured the four young winners (ages 11 – 17) of the Rotary Calgary Concerto Competition in concert with the orchestra; and our pre-concert recital features the runners up from that competition. This provides the young people the opportunity to not only increase their visibility within the Calgary community, but also to enhance their music ability and poise as they perform in front of a knowledgeable audience. Each winner also receives a bursary. This is a unique opportunity for young aspiring musicians to acquire experience playing with an orchestra which prepares them for competition at both national and international levels. As noted above, we also strive to remain accessible to the broader community by maintaining a price structure that is significantly lower than other performers in the same venue (Jack Singer Concert Hall). We have also worked with the National Music Centre at Studio Bell to offer our “Pop-Up Orchestra” program to the public at no cost. This family-friendly program features “Build an Orchestra” wherein the attendees can familiarize themselves with the various sections and instruments of the orchestra by getting “up close and personal” with the players and their instruments. The program concludes with an hour long mini-concert. This past year saw an audience of 300 – 400 people. Concert Season: The primary focus of the Calgary Civic Symphony is on providing five concerts per year at the Jack Singer Concert Hall. Each concert takes place on a Sunday afternoon at 2:30 pm in the months between October and June. In addition, we are regular participants in Alberta Culture Days through our Pop-Up Orchestra program that for the past two years we have operated in conjunction with the National Music Centre at Studio Bell. In order to provide these programs, our musicians and volunteers give more than 20,000 hours per year to fund raising and in preparation and support for our concerts. Calgary Concerto Competition: For many years we have worked with ARMTA (Alberta Registered Music Teachers Association) to offer the Calgary Concerto Competition for young musicians between the ages of 11 and 18. Each year, the four winners of that competition are given the opportunity to play with the orchestra in our final concert of the year (Rising Stars). In addition, the runners up are provided the opportunity to play a brief recital prior to that concert. The Civic has recently taken over complete responsibility for the competition. This competition has also traditionally been supported by Michael Lipnicki Fine Pianos and more recently by the Rotary Club of Calgary. Charitable Works: The Civic Symphony has been a participant in the Sun Life Arts and Culture Program for many years. Each year we donate 72 tickets per concert to that program, administered by the Calgary Public Library, and individuals who might otherwise be unable to attend a concert are given the opportunity to enjoy our music. Each year we also donate numbers of pairs of our season tickets to other charities and not-for-profits in support of their fundraising activities. Calgarians can support the Civic in a number of ways, including the obvious by attending our concerts. As noted above, our orchestra members and a small cadre of concert volunteers currently give more than 20,000 hours to the orchestra. We would welcome the involvement of additional volunteers to work with us in support of our concerts, in our fundraising initiatives and in our governance structure either by serving on committees or participating more directly in the Board. Until 2017, the Board of Directors consisted entirely of orchestra members. In 2017 we amended our bylaws to enable the election of members of the public to the Board and we now have 3 public members. We are looking for more members who have a strong interest in the Civic and our role to provide accessible, high quality symphonic music to a diverse audience of Calgarians. There is also an opportunity for interested members of the public to bring their skills to bear in one of our committees. In that regard, fundraising in the corporate community and among the general public is a priority. At the present time, just under 42% of our revenue comes directly (fees to play with the orchestra) or indirectly (working casinos or selling raffle tickets) from members of the orchestra. While our box office receipts represent approximately 37% of our total revenue, funds from other sources actually subsidize each concert, in part due to our efforts to maintain accessibility for the general public. Grants from the City and the Province account for 13% of our revenues and private donations account for the final 8% of revenues. On the expenditure side of the equation, our single largest cost is our concerts at just under $90,000 for our five concerts which consists of our hall rental and ancillary costs as well as those occasions on which we must pay to bring in additional musicians to fill out the orchestra. The Civic has two part-time staff, our Artistic/Director and Conductor, and our Executive Director. In addition we provide honouraria to some musicians who fill specific roles. We also on occasion must pay fees to additional musicians required to fill out the orchestra and on those occasions where we bring in soloists we must pay them a performance fee. The total of these funds amounts to approximately $66,000. Our largest administrative costs are $16,000 for marketing and advertising, and $5,000 for office expenses which is largely made up of our cost of renting percussion storage space and space for our music library. Our total expenditure budget for 2018 – 2019 is just under $195,000. Our funding priorities are focused on sponsorships which can include season and concert sponsorship, conductor sponsorship, sponsorship of chairs, visiting soloists or your favourite musician. It can also include sponsorship of events such as the “Pop-Up Orchestra” for Alberta Culture Days, the Rotary Calgary Concerto Competition or other events that might include home concerts which can provide increased visibility for the orchestra and income for our musicians.